Looking for the perfect Springtime dessert? This Lemon Crepes recipe might just be it! 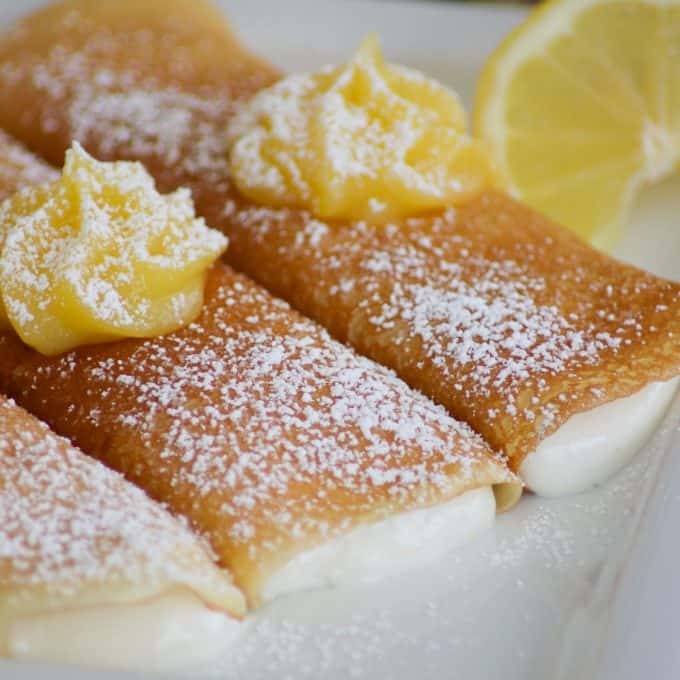 These thin, light pancakes with a zesty mascarpone-cottage cheese filling are topped with a homemade lemon curd for a sweet taste of citrus in every bite. It’s a delicious recipe for a Mother’s Day brunch or any day. Are you in love with crepes as much as I am? Seriously, I cannot get enough! And don’t tell anyone, especially my son Cameron – BUT since he left for his hike of the Pacific Crest Trail two weeks ago, I’ve made this Easy Crepe Recipe at least three times. It’s his favorite. AND I may or may not have eaten them all. by. myself. Crepes are much easier to make than you might actually think. If you haven’t tried making them yet, please do so. I really believe that once you add them to your repertoire (of course, I had to add that French word! haha) that you’ll just continue to make them. AND the more you make them, the better you’ll get! 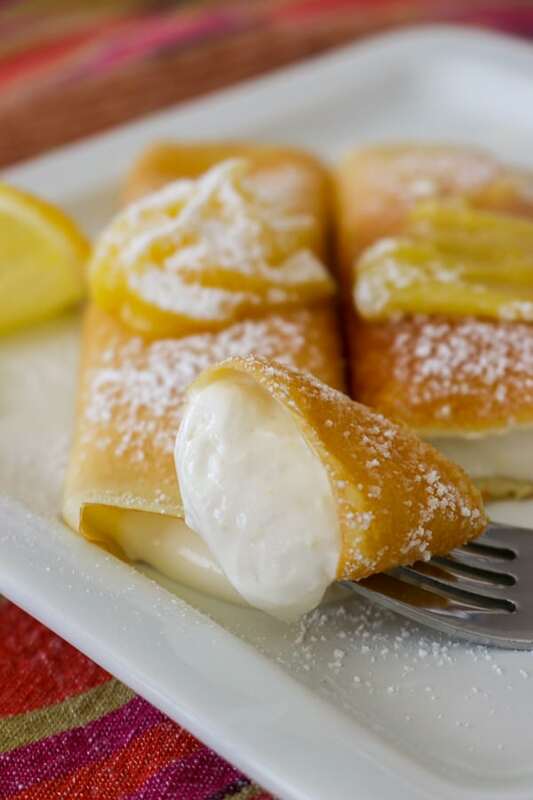 Use a combination of mascarpone cheese and cottage cheese in the lemon crepe filling. I’ve used just cottage cheese in my Cheese Blintzes with Strawberry Sauce and that’s delicious, but the addition of the mascarpone gives it a rich creaminess. I know that many crepe fillings use ricotta, but using low-fat cottage cheese is a great way to cut down on calories. If you’re pressed for time, lemon curd can be purchased at your local grocer, but as always, anything homemade is well worth every single bite. Serve each lemon crepe with a dollop of lemon curd on top. You can use a piping bag to make the dollop more decorative. Dust the plated crepes with powdered sugar to make them even prettier! You may be saying to yourself, “Self, I like this Lemon Crepes recipe, but it may just be a little too much – too sweet, too complex for me to make, too time-consuming.” I get that and certainly don’t fault you for it. That’s why there are SO many wonderful crepe recipes around the web. Like these Avocado Crepes with Lemon Tahini Filling. Don’t they look delightful? I’ve been on an avocado kick lately, so these savory crepes are something I’d surely like to add to our menu! If you’re feeling really adventurous, make this Lemon Meringue Crepe Cake. How beautiful would this be to serve the lemon lover in your life on their next birthday? Looking for a low carb and gluten free crepe recipe? Make these Coconut Flour Crepes with Lemon Ricotta and Blackberries. Heck, even if you aren’t low carb and gluten free make them anyway because they look pretty darn delicious! This Lemon Crepe recipe may look complicated, but it’s not really. There are just three important components to it and instead of sending you to the Easy Crepe Recipe and the Lemon Curd I’ve added them both here. It’s one full recipe for your printing pleasure! Don’t be intimidated. You can do this AND you can even look up videos on how to make crepes should you run into trouble. As with any recipe, it is very IMPORTANT that you read it in its’ entirety before you begin. I would hate for you make the crepes and the lemon curd only to find out that you now need an additional 3 hours before you can even start making the filling. Soooo, since the cottage cheese will take a minimum of three hours to drain, it is best, to begin with that step. During this time, you can make the lemon curd and give that time to cool. The crepes can also be made the day ahead. Just store them in between layers of wax paper, place them into a gallon size storage bag and refrigerate. Voila! Looking for the perfect Springtime dessert? This Lemon Crepes recipe might just be it! 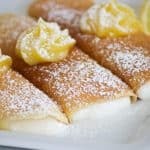 These thin, light pancakes with a lemon mascarpone-cottage cheese filling are topped with a homemade lemon curd for a sweet taste of citrus in every bite. It's a delicious recipe for a Mother's Day brunch or any day. Place a colander over a bowl and line it with 2 layers of dampened cheesecloth. Place the cottage cheese into the colander and cover with plastic wrap. Place a heavy object on to the cottage cheese and let stand for 3 hours. Place a medium bowl over a pot of simmering water or use a double-broiler. Do NOT allow the water to come to a boil. Keep it at a simmer. Put the butter, lemon juice, zest, and sugar into the bowl and stir until butter is melted and sugar is completely dissolved. The mixture will no longer feel gritty when rubbed between two fingers. Whisking constantly, slowly ladle a little bit of the lemon mixture into the eggs. Slowly add the egg mixture to the lemon mixture while whisking continually. Continue to whisk and cook until lemon curd is thick, up to 20 minutes or more. In a blender, combine the crepe ingredients - eggs, milk, salt, flour, vanilla, sugar and only ONE tablespoon of melted butter. Blend until completely combined. Scrape the sides down the sides of the blender, removed from the base as needed. Cover and let sit for at least 30 minutes. Heat a crepe pan or 8-inch skillet over medium heat. Brush lightly with melted butter. Using a scant 1/4 cup of batter, pour into the center of the pan. Gently and quickly swirl the pan to evenly coat the bottom. Cook for about 1 minute before circling the edges with a hard spatula to loosen. The edges will be a light golden. Guide the spatula under the crepe and flip to cook on the other side for about 30 seconds or more until cooked through and golden. Place on to a plate until ready to assemble. Place the drained cottage cheese, mascarpone, cheese, lemon juice and zest, vanilla, sugar, and one tablespoon of milk into a blender. Mix until smooth and well combined, adding additional milk one tablespoon at a time if necessary. On a plate or clean work surface, place about 3 tablespoons of lemon filling down the middle of one crepe. Fold the two edges over and turn the crepe right side up. Gently flatten so that the filling is evenly distributed throughout the crepe. Add a dollop of lemon curd with a piping bag. or with a spoon. Aren’t they gorgeous? The golden color of the crepes, the bright lemon color of the curd – it all just screams Spring to me! 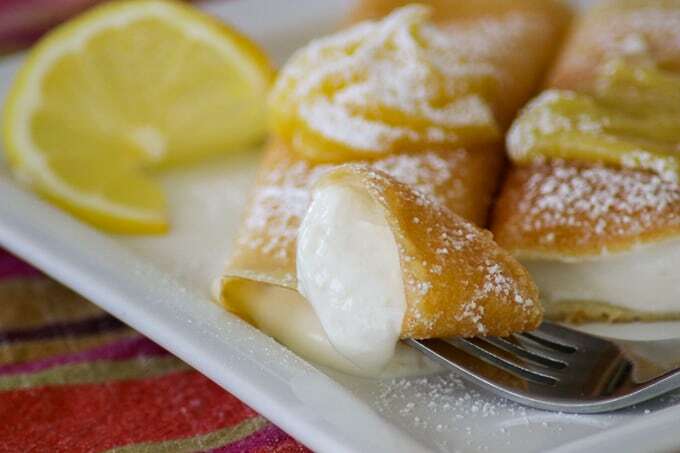 I think you’ll like these Lemon Crepes. We certainly did! They will be perfect for Mother’s Day, a special birthday dinner or even next Easter! You can always omit the curd, too and just top them with some powdered sugar. They’ll be delicious like that as well. However, that homemade lemon curd does add something special.